. After the installation is completed we are ready to use nmap. We can either use nmap in CLI mode or we can simply use the GUI. In this guide we will use the GUI (just run Nmap - Zenmap GUI). NMAP is probably the most known tool for port scanning and network testing. It is so powerful that can be used as well for good and by hackers as a starting point for malicious activities. Nmap has a lot of commands, but in this example we will list the commands that we use in this guide. Usually it will be more than enought for most people. -sS this is a TCP SYN scan. This kind of scan is capable of scanning even thousands of ports per second. This kind of scan "asks" the devices to start a TCP connection, but it doesn't acknowledge it, so no TCP connection is done. For this reason it is considered to be stealthy. -sU is a UPD scan. -sSU is combination of UDP and TCP port scanning. 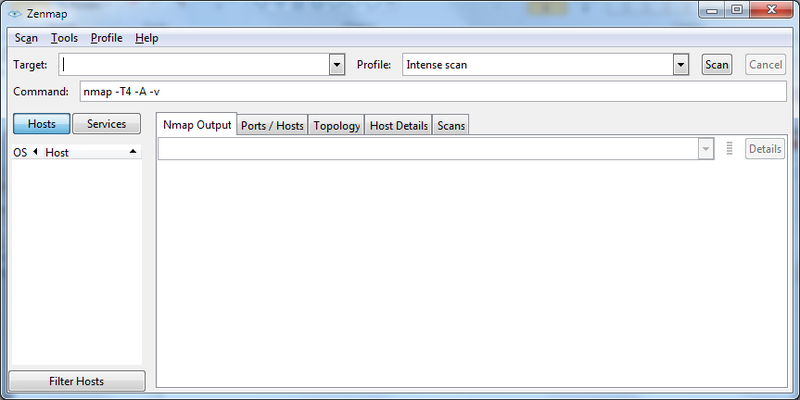 -oN Specifies the output file that will contain the information that npmap will write while scanning the network. This is the "normal" output. --append-output With this option on, nmap will create an output .txt file if there is such a file yet or, if there is already a file with the provided name, it will add the new collected information below. Without this option nmap overwrites the output file. –open If you want to avoid nmap listing devices that do not have any port open this option is what you are looking for. It will list only the devices that have at least one port open or "maybe open"
-n Will give you only the IP address, without hostname. It will make the scan significanly faster. The Normal output of nmap that we get thanks to -oN can be hard to edit later. Especially if you scan a big network and you need to put the output data in Excel and use data filters. 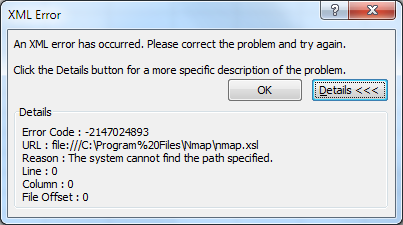 For this reason it is a good idea to Export in Excel or in all the nmap supported output formats. In case a format is not good, you can take the data from the other output file that better suits your needs. In order to fix this error you have to open the .xml file with a text editor and delete the whole line that starts with <!DOCTYPE, and then save it and try again. Open the .xml with excel and when prompted, select "Open the file without applying a stylesheet"
and the choose "as an XML table"
and the file will open in a nice excel table with headers and the possibility to use the filters straight away.